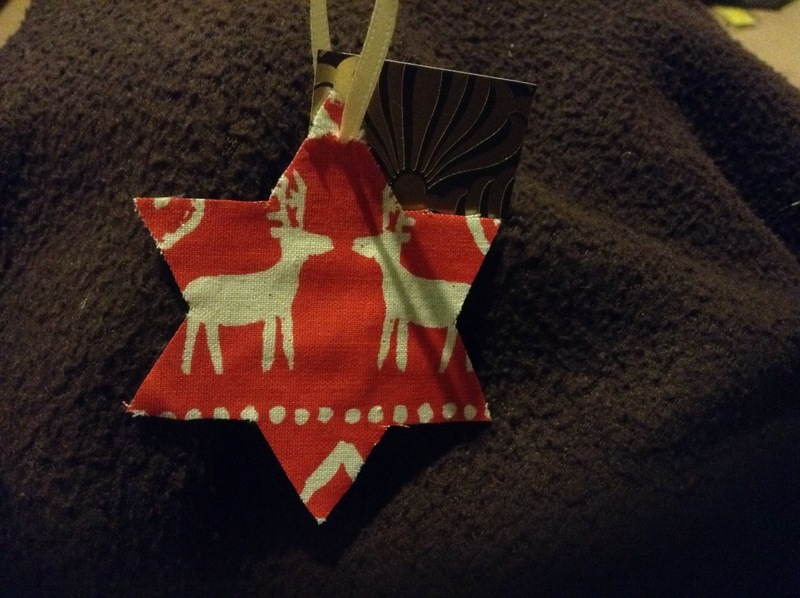 Even though it feels like I did nothing, I did actually manage to squeeze in a tiny bit of crafting at Christmas. You might remember last Christmas (I vaguely do…) that I made an advent calendar of Christmas stockings for my work – this year, while I still wanted to do something, I needed it to be on a smaller scale. My desk is messy enough without adding Christmas decorations to it, but I decided I wanted just a little something. We always seem to leave getting a real Christmas tree til the last minute and with the beloved being away through the week, I knew history would repeat itself, so I had an idea for a mini tree. It’s probably the first time I’ve done something without the aid of a pattern, just going from an idea in my head – and for a first attempt, I’m pretty pleased with it. It sat perfectly atop my Mac monitor for most of December and then I gave it to a colleague for her daughter. Want to know the how to? You’ll need card for templates, felt, beads for baubles, beads for spacers, a cork, a short length of wire and something for the decoration at the top of the tree. Make three star templates , each one slightly smaller than the next. I went for 6-points, because I knew I wanted two ‘baubles’ per star and I’m a sucker for symmetry. Cut three of each size from your felt. 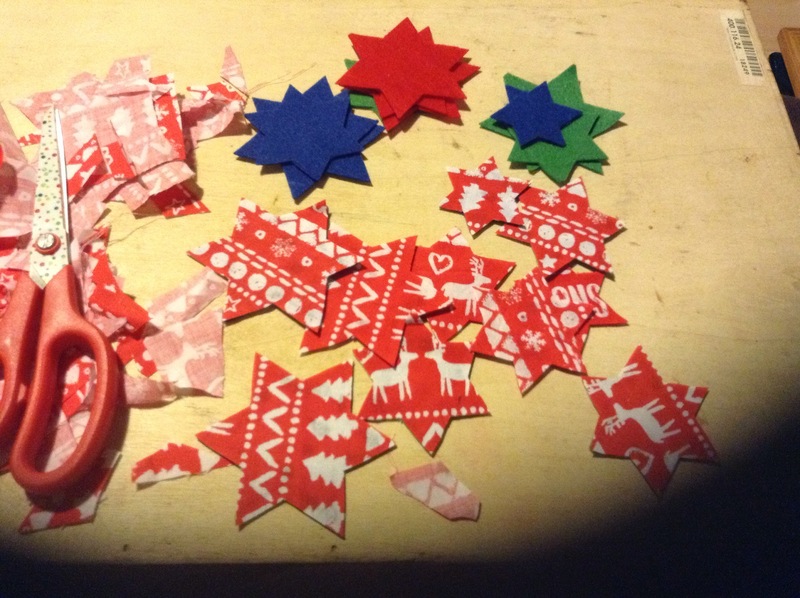 This was the trickiest part – sewing on the ‘baubles’. I chose three sizes, in relation to the size of the star. 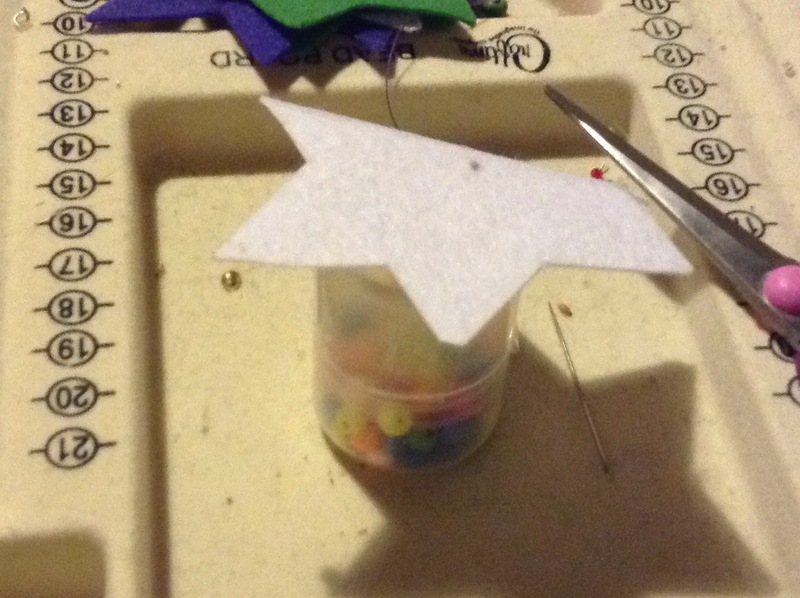 The first attempt saw me using fine nylon fishing line – I use it in beading quite a bit – and glueing the bead to the line, after threading the line through the felt. It meant the bauble hung nicely, but was ultimately just too fiddly. So I switched to invisible thread, and just sewed them, leaving a little gap between felt and bauble. Next, take a length of wire, I think I used a mid gauge – stiff enough to stand on its own once in the cork, which I cut to size as it was too deep. I used spare plastic beads that I didnt want to act as spacers in between the stars so they sat better and then topped it off with a button in place of a fairy! I’m definitely going to try and make more of these next year – they’re cute and festive. Oh and I eschewed normal cards this year too….just because. Felt + festive material from last year + micro tags + ribbon = a card that doubles as a tree hanging! If I start now, I may actually get some done in time! 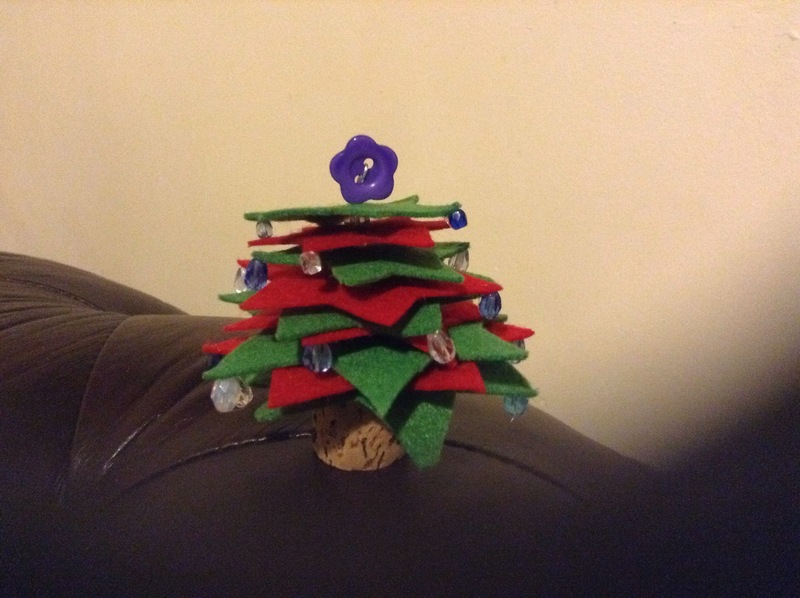 This entry was posted in Christmas, sewing and tagged Christmas cards, Christmas tree, felt, sewing, tutorial.